Architectural style 3 Pillars brass stand. This polished solid brass stand holds eggs, spheres or paperweights from 2" to 3 1/2" wide. Best Seller in 3 Sizes! Art Deco Dragons polished brass stand has three deco style dragons on a curved triangular base. This attractive stand is available in two sizes to fit most crystal balls, spheres or paperweights. The lacquered finish assures long term easy care. Polished solid brass stand. Elegant and highly polished Ornate Scroll brass stand. 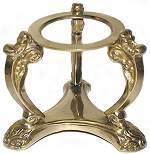 This polished solid brass stand holds eggs, spheres or paperweights from 2" to 3 1/2" wide. Charming solid brass stand features three Bunny Rabbits to hold your favorite eggs or spheres. A perfect decorative piece for your painted Easter eggs. Intricately crafted this piece makes an excellent addition to any collection or office setting. This polished solid brass stand holds eggs, spheres or paperweights from 2" to 3 1/2" wide. 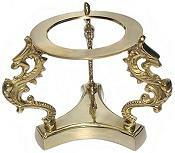 Decorative Winding Boughs solid brass stand gives height to your favorite spheres. This unusual polished, solid brass stand is available in two sizes to fit most eggs, crystal balls, spheres or paperweights from 4" to 6"
What better to hold a prized, winning Baseball than this Baseball Bat Stand in beautiful polished solid brass. This great desk accessory can be set up both ways, with handles at the top or bottom, so it can hold a globe or glass Baseball from 1 1/3" to 3 1/3" wide. What better to hold a prized, winning Golf Ball than this Golf Club Stand in beautiful polished solid brass. This great desk accessory can also hold a globe or glass golf ball from 1 1/2" to 4" wide. Lovely freeform bird shapes rise up to hold your favorite sphere. Polished solid brass art deco style crystal ball and sphere stand will add elegance to your collection. Seen with an 80mm Alexandrite crystal ball which is available separately.